20110903 - Up in the am and no games or anything on the schedule: except the first OSU football game :-) We hung out at home all day and got stuff done around the house. Gma&paW stopped after the hottest football ever for a visit. In the evening we loaded up and headed to Tecumseh outdoor drama. 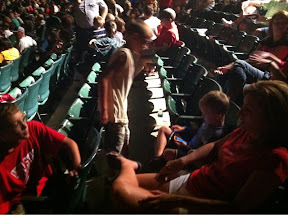 We were about 6 rows back and the boys loved it. D's throat started hurting and G in his normal quiet voice narrated parts of the show for all to hear... "is that a real horse?! ", "Why is that guy crying?!". It was a good show and we got home late.